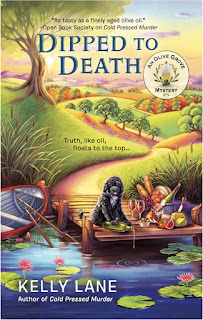 We're delighted to have as our guest today Kelly Lane, author of the OLIVE GROVE MYSTERY series. 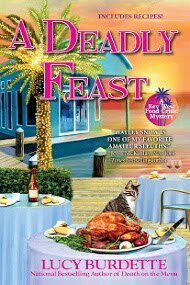 This delightful series is set on an olive plantation in Southern Georgia and if you're an olive oil fiend, like I am, you'll love all those details, along with the fun, smart mysteries. And of course, recipes are included! 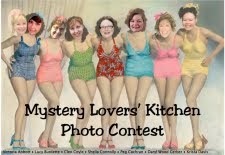 For years, I’ve enjoyed following Mystery Lovers’ Kitchen ... and now I’m here! I’m thrilled to be a guest in the kitchen. Thank you for the invite. Here’s the story and recipe for one of my favorite after-work treats. 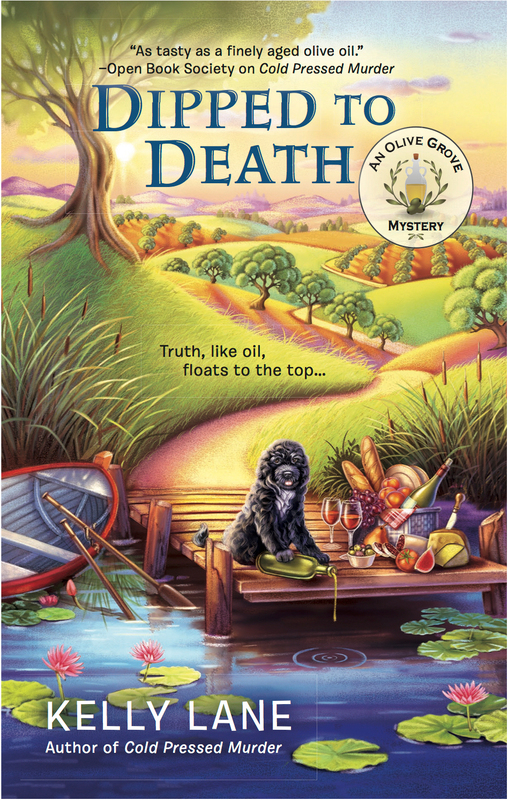 These days, when I’m not banging away at my keyboard — DIPPED TO DEATH, book three in Berkley Prime Crime’s Olive Grove Mystery series was released earlier this month — I work with five-, six- and seven-year-old kids in the local primary school. And, let’s face it, after hour upon hour of non-stop pandemonium in classrooms filled with clamoring kids, untied sneakers, runny noses, and glue stick-covered everything, when I finally make my escape home, I want to enjoy a treat. That’s when I fix myself a strong cup of hot tea to relax, along with a crunchy snack to munch away my stress. I always crave something sweet and satisfying, with the crunch of biscotti. The piquancy of a gingersnap. And the chunky richness of shortbread. Plus, I’m wanting a treat that features olive oil. 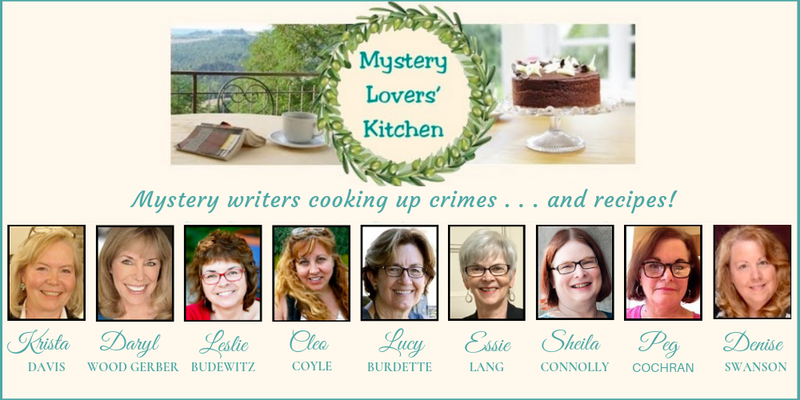 That’s because while writing the OLIVE GROVE MYSTERY series, I’ve had to come up with all sorts of olive oil-based recipes, for savory and sweet dishes. And, wouldn’t you know it? Rethinking my “regular recipes,” transforming them into “olive oil recipes,” has been a life-changing endeavor. Now that I’ve started, I can’t stop reinventing all my dishes! There are so many health benefits to olive oil, and the distinctively mild, fruity, and floral flavor of fresh olive oil is divine, especially in desserts and sweet dishes. So, I figured I’d create my own afterschool treat with olive oil. Something not-too-sweet, combining the mellow, sweet nuttiness of olive oil with the spicy kick of gingersnaps, the crunch of biscotti, and the thick, richness of shortbread. My Olive Oil Orange and Ginger Guilty Pleasures (yes, I know … it’s a mouthful!) are rich, crisp, and crunchy, yet not overly sweet. The recipe is relatively simple and the ingredients are inexpensive. Plus, one can make the dough for these treats into individual cookies, bars, or wedges. And you can vary the thickness, depending on your preference. Just to demonstrate, recently, I split a batch and made the treats two different ways. I pressed one half of the dough into an 8” round cake pan, then, just after baking I sliced the round into wedges. Also, I rolled out the second half of the dough until it was a bit thinner than the dough in the round pan. Then I pressed cookie cutters into the flattened dough. Using a spatula, I carefully placed the cookie shapes on a jelly roll pan. Then I baked both versions in the oven at the same time, taking out the flatter cookies a few minutes earlier than the round pan. For a sweet recipe, look for a mild or buttery extra virgin olive oil, such as an Arbequina variety. If you don’t want to splurge on an oil from an olive oil producer or specialty shop, two olive oils that are relatively easy to find in the United States are the Mild and Buttery EVOO from California Olive Ranch, and Trader Joe’s California Estate EVOO. They are both staples in my kitchen. Also, when baking with olive oil, ahead of time, I freeze or chill the oil until it is at least the consistency of softened butter or margarine. This only takes an hour or two in the freezer. Once I’ve gotten the consistency I want, I remove the oil from the freezer and keep it in chilled in the refrigerator, taking it out only when I’m ready to use it. The same method works for basic pastry dough: I replace shortening or butter with chilled olive oil. To chill the oil for this particular recipe, I used a clean, empty, glass container from Oui French style yogurt; it held exactly ¾ cup of oil. Like basic pastry dough, this dough should be kept cool and handled as little as possible. I’d almost describe it as “fragile.” Resist the temptation to overwork it (take a deep breath and back away)! When pressing it into a disk, it’s better left crumbly and messy rather than uniform in consistency. Also, the dough gets better the longer it’s chilled; between 30 minutes and 3 hours is ideal. 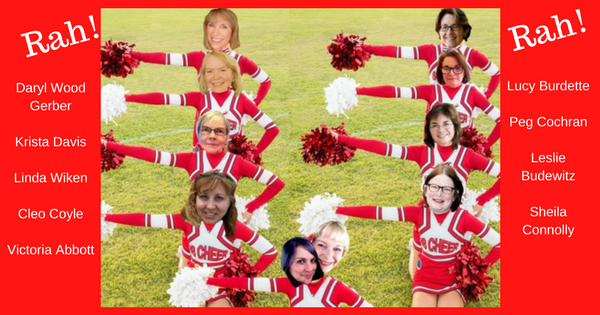 Thanks so much for inviting me to share. I hope you give my Guilty Pleasures a try. Better still, I hope you find the time to relax and enjoy them as much as I do. Oh … did I mention that these treats are heavenly with a big glass of milk before bed? Chill ¾ cup extra virgin olive oil in freezer until it is the consistency of softened butter. Transfer to refrigerator until ready to use. In a food processor (or bowl, using a pastry cutter or two knives) pulse/combine together flour, sugar, salt, and orange zest. Add olive oil, a small scoop or chunk at a time, while pulsing/cutting. Add vanilla and ginger. Pulse/combine until mixture is in fine crumbs. Pulse/combine again until crumbs begin to come together. Dough should remain crumbly. Do not over process. Remove dough from processor/bowl. Press together and flatten into a disk on plastic wrap. Do not over-handle dough. Wrap and chill in refrigerator for at least 30 minutes (the longer the better … three hours or more, if you can). For individually baked treats: Roll chilled dough to no less than ¼” thickness onto floured surface. Cut dough with a cookie cutter, or into squares, wedges, or bars with a knife. Transfer to cookie sheet or jellyroll pan. For pan-baked treats: Place dough into round 8” or 9” cake pan. Press flat to fill pan. Bake in 300-degree oven for 20-30 minutes. Do not over-bake. Remove. Optional: When just out of oven, sprinkle with ginger bits. For individually baked treats: Let cookies rest 5-10 minutes on sheet/pan. For pan-baked treats: Let pan rest 5-10 minutes on a wire rack, then, while still warm, cut baked dough into wedges. I’ve had success cutting wedges inside the pan, and also, I’ve removed the entire round before slicing wedges. To avoid crumbling, slice while round is warm and soft. Transfer treats to wire rack and let cool completely. When cookies are completely cool, they may be dipped or glazed with dark chocolate, a couple pinches of sea salt, and olive oil. Or use dark chocolate, salt, and paraffin wax (paraffin gives the chocolate a glossy finish and remains firm at room temperature). Or, for a sweeter version, try drizzling an orange glaze made from orange zest, orange juice, and confectioner’s sugar. The cookies pictured here are dipped in warm chocolate, olive oil and sea salt. The chocolate is sprinkled with sweet ginger pieces. Kelly Lane lives on a farm near Charlottesville, Virginia. 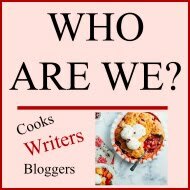 In addition to her work as editor and “slush pile reader” for a prominent literary agent, she has penned as a copywriter, journalist, and worked as a business writer, editor, and public relations consultant for Fortune 500 companies. 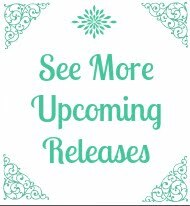 Set on an olive plantation in Southern Georgia, ONE FOOT IN THE GROVE, COLD PRESSED MURDER, and DIPPED TO DEATH are the three books in Kelly Lane’s OLIVE GROVE MYSTERY series published by Berkley Prime Crime. 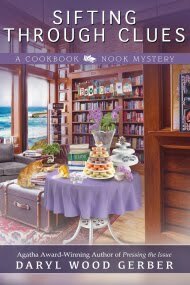 Each book includes original recipes inspired by dishes in the story. 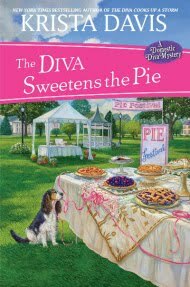 To win a copy of Kelly Lane's newest book, DIPPED TO DEATH, just leave a comment along with your email address. A random draw will be made on Monday, 6 PM EDT. Glad you found what you were looking for ... I'll have to send a little thank you payment to Wells Fargo!